Size : 16.0 x 17.0 mm. Weight : 3.15 grams. Grade : gF with weak areas. 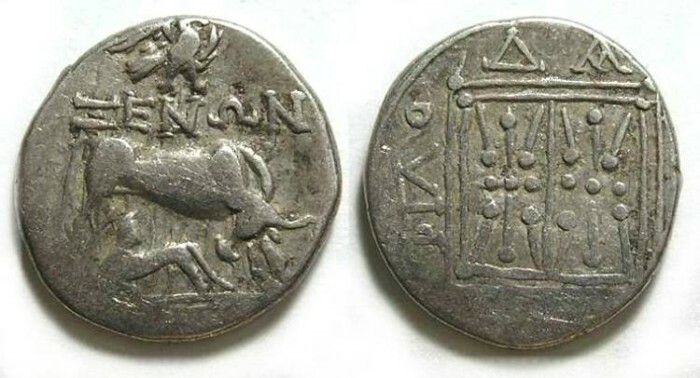 Obverse : Cow with calf, with head of Apollo above, and the moneyers name XENWN above the cow's back, with a small eagle above the name. Reverse : Double star pattern in a square, with an inscription naming the city around, but much of the name is not struck up. This type is from very late in the Dyrrhachium series, at a time when there was a high mint production and most coins were struck carelessly.